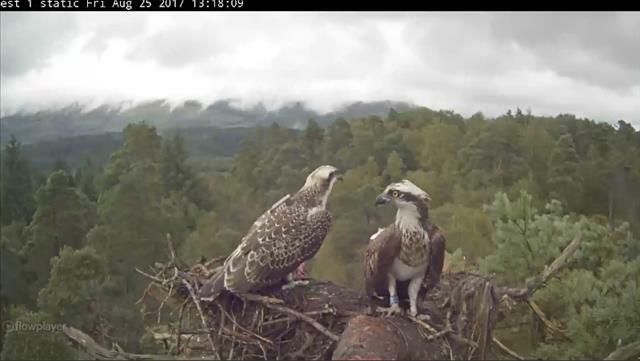 We last saw Aeron 24hrs ago at around 8am Sunday morning. 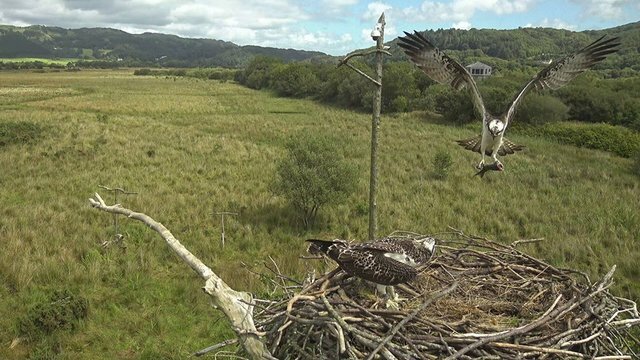 Clarach and Cerist hold the record for earliest migration from the Dyfi, both 81 days old. 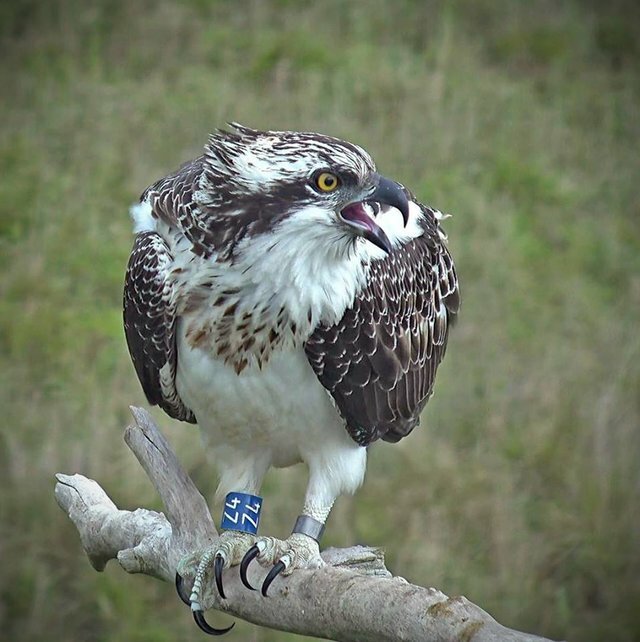 Aeron was 84 days old yesterday - has he gone? 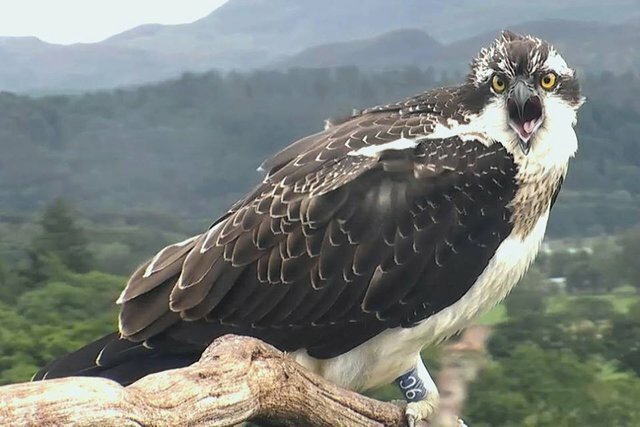 We'll keep an eye out for him today, look everywhere we can, and let you know tonight. 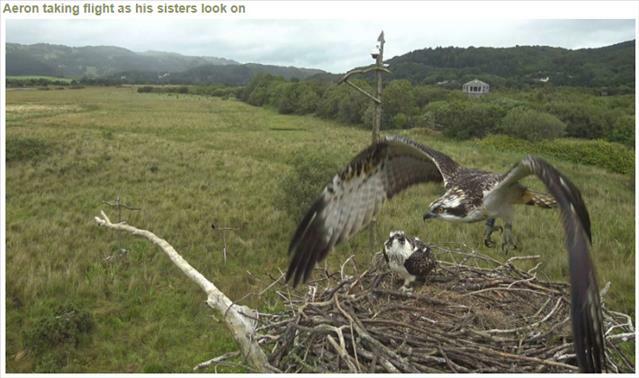 The two sisters remain on the Dyfi, still being fed by Monty. 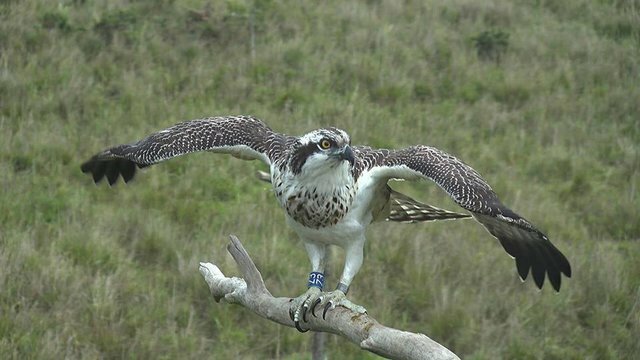 Here's Eitha impersonating an osprey that hasn't eaten for a week! 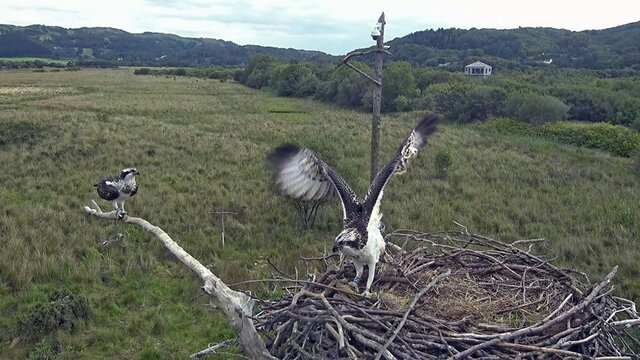 We're pretty sure Eitha has caught her own fish this morning. She returned with this flounder at 10:05 and was soaking wet. 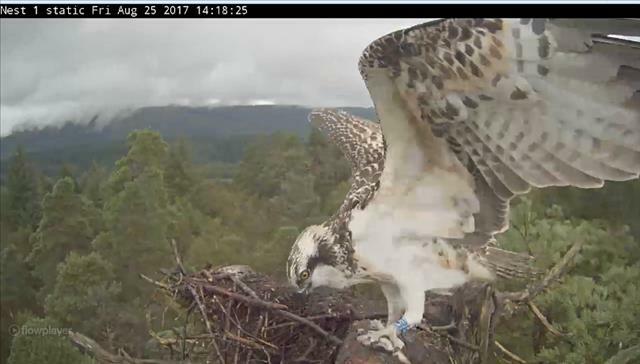 are now becoming less frequent and she will spend a lot of time away from the nest site. 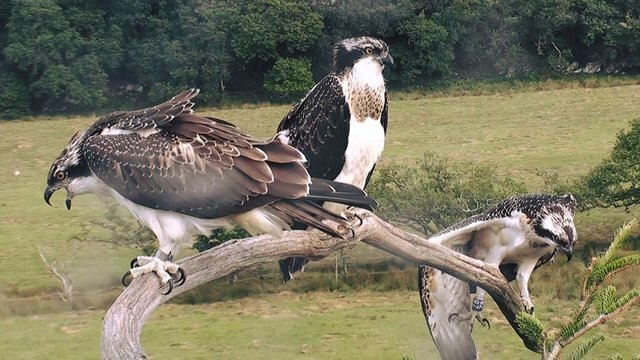 20 August - Z6 and Z8 waiting on Aran's return with a fish yesterday evening. 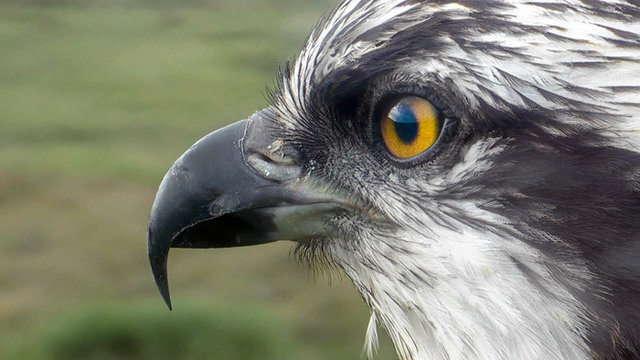 He didn't disappoint them. 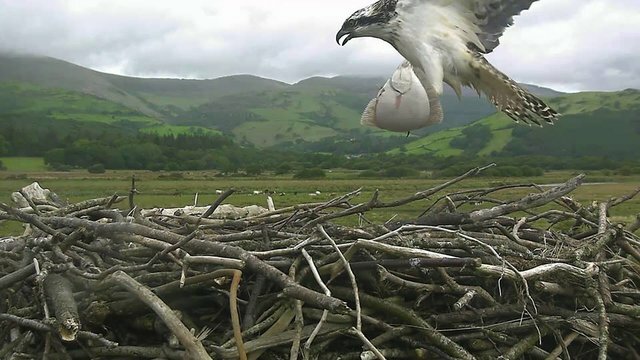 August 20 - Fantastic News. 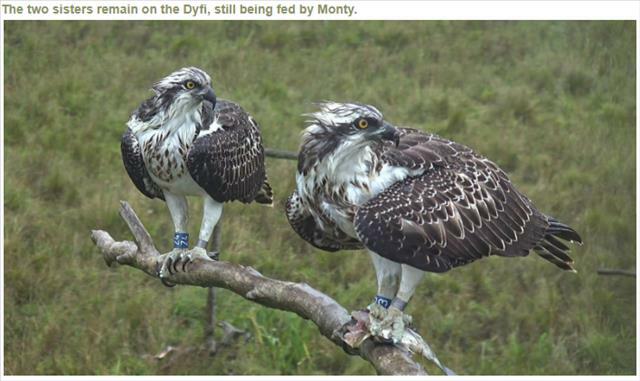 was photographed at Leighton Moss on 25th July by John Dodds. 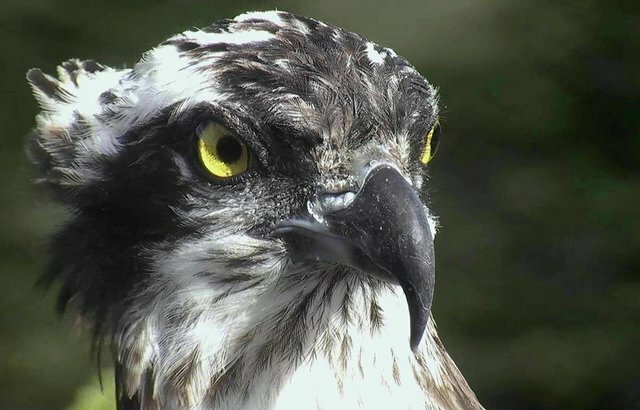 so the sighting of him is especially poignant to us all. 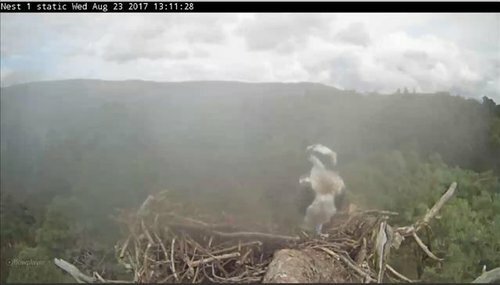 on 19th June when he was 37 days old. 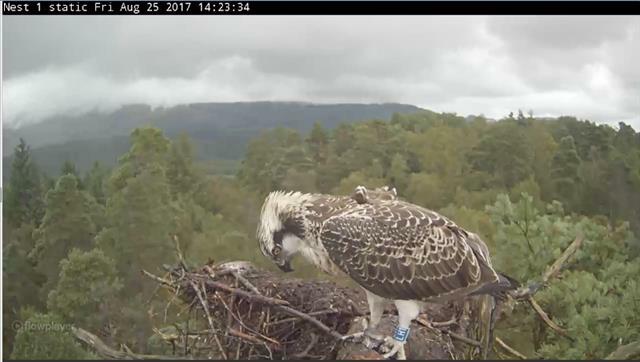 He was judged to be a male weighing in at 1440g. 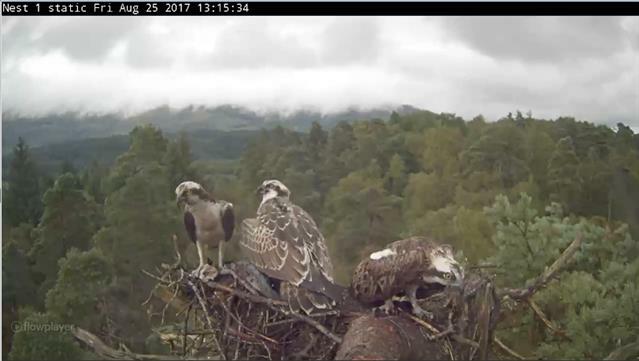 in a tree close to the river. 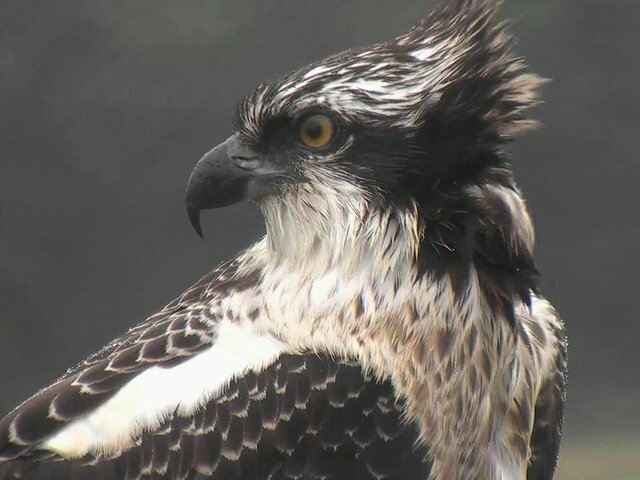 We last sighted him on 25th August 2014.
in our hide logbook at 7.15am by volunteer Chris, who wrote – '2AM leaves the bay… migrating?'. 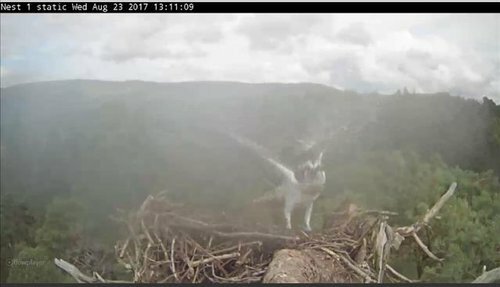 his journey should be off to a strong start. 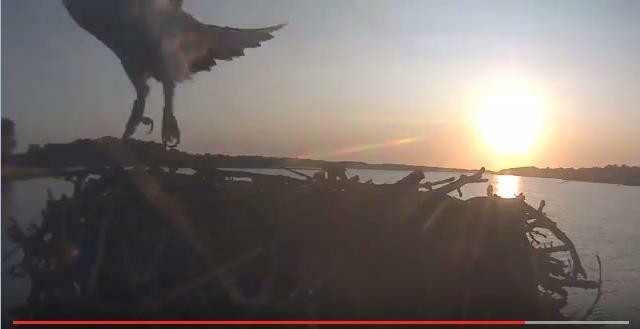 Here are his final moments on the nest. 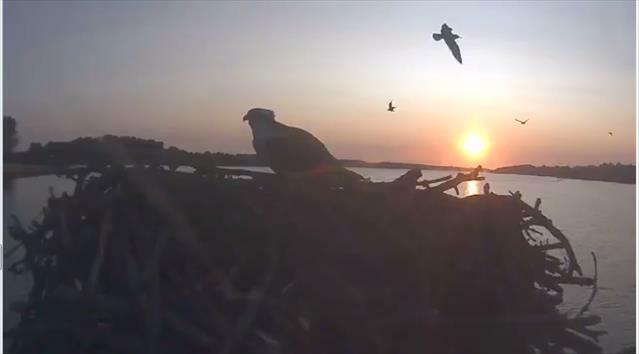 and black headed gulls flying all around him – what a scene! 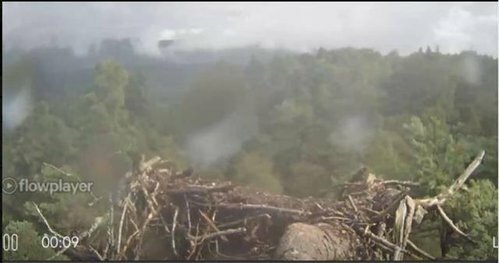 Aberfoyle, Scotland: We had some pretty wet weather overnight with loads of thunder around 5 this morning - looks like the osprey nest has suffered a bit! 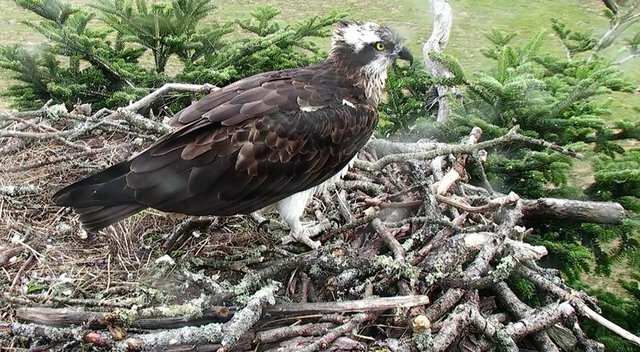 At least it wasn't earlier in the season when Clarach still had eggs or young chicks. 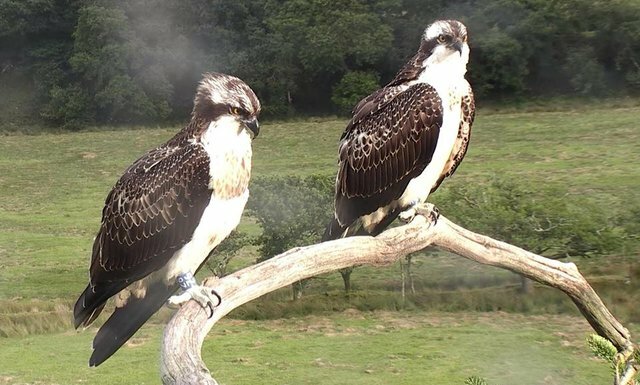 As they've both fledged and been spending time on and off the nest both LH0 and LH1 will be fine - we just might not see them as much between now and when they depart for warmer (and hopefully drier!) 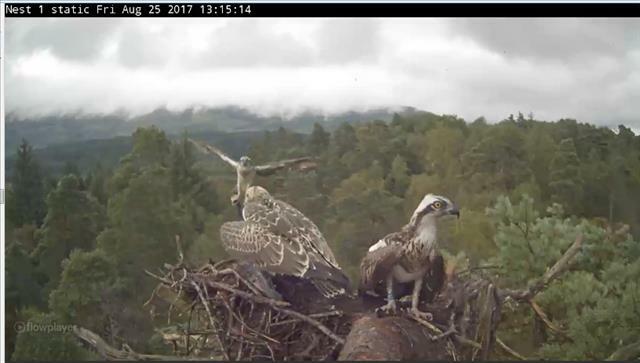 weather! 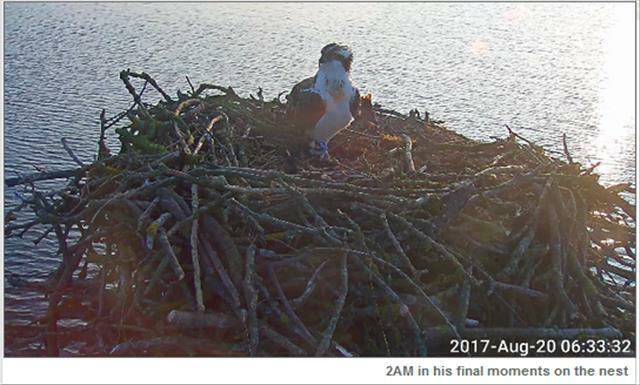 The nest will be checked out over the winter and sections reinforced if needed ready for next year. 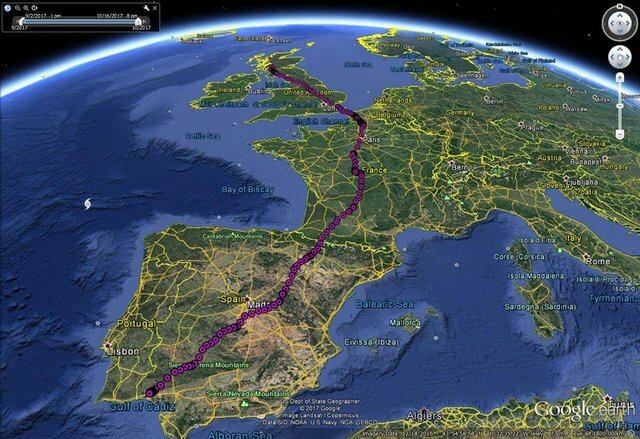 LH0, is still in southern Spain. Will he stay in Europe? 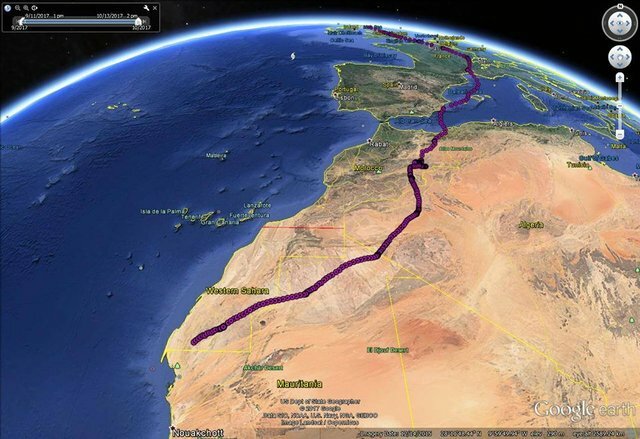 Some British ospreys never make it over to Africa and migrate to Portugal/Spain instead.